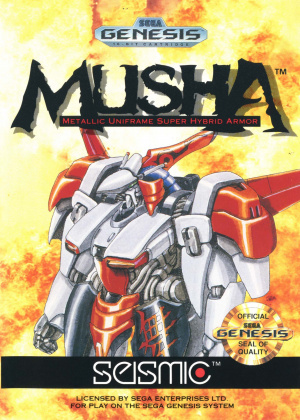 We've got much love for MUSHA! Mention the name Compile to any serious shooter fanatic and you’re likely to be faced with a barrage of nostalgic ranting. 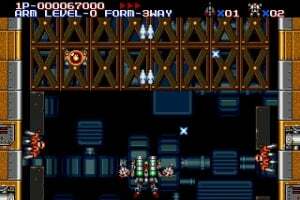 The now defunct company was responsible for some of the finest blasters the video game industry has seen, including Super Aleste (also known as Space Megaforce), Gunhed and Zanac. Surprisingly, MUSHA (which stands for 'Metallic Uniframe Super..
MUSHA is a Sega Mega Drive / Genesis game that shooter fans favor for its intense and exciting gameplay. 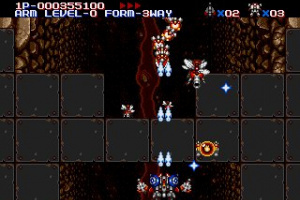 Players must control Terri, a girl who pilots a MUSHA (Metallic Uniframe Super Hybrid Armor). Terri's goal is to eliminate Dire 51, an Intellicomputer that has gone out of control and is planning an offensive attack upon humanity. 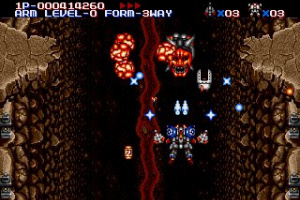 Use special weapons like the Vanishing Buster, Blazing Beam and Defensive Detonator, along with offensive options that allow six types of formation fire. Battle through seven exhilarating levels to finally reach and destroy Dire 51 once and for all. This seems excessive. I don't know what better word to use for what I just viewed, but I don't think I would really enjoy playing this. 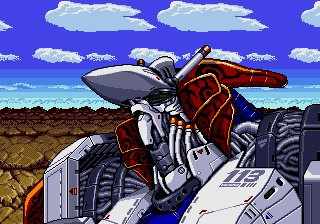 I like shooters too, like, I enjoy R-Type, Gradius and Lords of Thunder. This just looks frustrating. Didn't this game come out for the Sega-CD? If so then i definately played this and really enjoyed it. Best v-shooter on the genny. 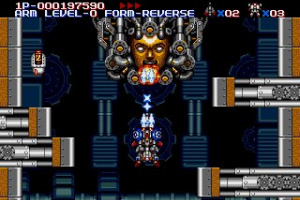 CuzinMike - The 'semi-sequel' was released on the Sega CD. 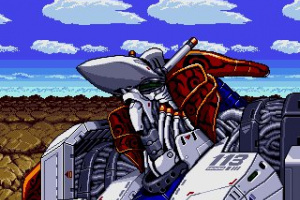 It was called Dennin Aleste in Japan and Robo Aleste in the West. It's a lovely shooter but personally I prefer MUSHA. I rented this game all the time back in the day! 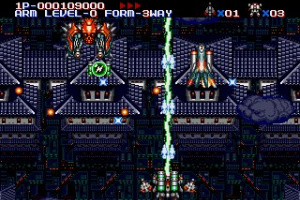 Awesome shmup! Good Lord, why the feck is it taking so long to release these classics!? This, Lightening Force and Hagane should be out right now. My frustrations are brimming! Sigh.... 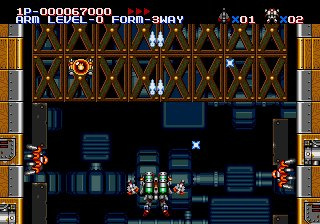 Yes, this game is better that Robo Aleste. This should be top priority, IMO. 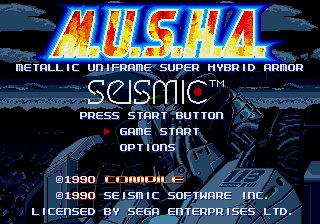 If there was ever a game that warranted its price on the VC, it's definitely MUSHA. Look at the eBay prices when you get a chance. G-D, I am speechless! That was one of the best shooters I have ever seen! There seems to be more things to upgrade and more levels to upgrade to than Super Star Soldier, though, maybe I wasn't paying enough attention. I don't know why you need to keep on getting those missile things, but I will risk life and limb to get every one of them! Why is this not out yet?! I've hardly even heard of this game, but it looks great! Reminds me of Soldier Blade for some reason. It looks at least 3 times tougher though. Why isn't this out already?! 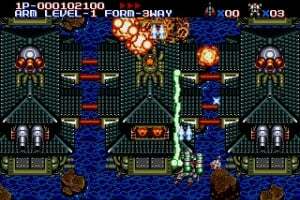 Actually, I remember seeing this game in a list of the top ten best shooters, along with Axelay, Fantasy Zone, and River Raid(first I heard of any of those games, too). It was more of a personal opinion really, but that it still a good indication of this games greatness. I think you're thinking ign's list of the top 10 shooters. Come to think it I remember first hearing of this game from that list too. It was like no. 5-ish. First heard of Fantasy Zone in one of their "fond memories" articles. I downloaded it a month or so ago and it's pretty fun. I'd been holding out for Super Fantasy Zone, but it's nice to hear that the original was pretty good too. Who knows, maybe I'll download it with some spare points, or something like that, though, not before Star Tropics and Punchout!. Edit: Bah, and now I'm putting off Super Fantasy Zone until Star Parodier, so I can get both games together. When will it end! Edit again: Okay, I got Star Parodier, but ran out of money for Super Fantasy Zone. 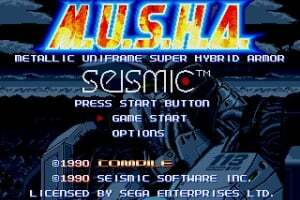 M.U.S.H.A sounds and looks really great, so another great Shoot'em Up is coming =). 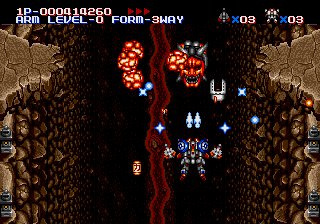 This and Thunder Force IV are the two best Genesis shmups, and two of the best shmups period. This didn't get released in Europe (according to gamefaq). Looks like the EU will have to wait for import week (although it will be released in 50Hz ). @RadioShadow I hope you are wrong. 900 points is just not worth it for a botched Mega Drive game with possible watered down PAL music. Besides other import games for PAL run in 60hz so why Sega converts them to 50hz is beyond me. Okay, having watched the video for the 5th or 6th time, I'm still greatly impressed, and I am eagerly anticipating the arrival of this marvelous shooter. Looks interesting, but not so sure if I want it. VC-Reviews says no and that it will cost 900 points if and when it comes here. It will cost an extra 100 since it never came out here. And yes it is supossed to be good. Well, it looks good. I'll probably get it. @slangman: I would love to be proven wrong but all the PAL Mega Drive Imports were set to run in 50Hz. can someone tell me the difference in PAL? I hear alot about the 50hz thing, but am not sure what you guys are talking about nor what the diffrence is between pal and what we have over here. WHAT???!! That's an outrage! If this runs in 50hz then I am no way downloading it. As someone who owns the original cartridge (which will run you $100 dollars without a box or manual), this game is more than worthy of everyone's VC collection. 800 points and you have one of the best Shooters ever mad (seriously, out of the top ten, this is probably 5th). You are robbing yourself if you don't get this. One of my favorites. If you're a shooter fan, you've got to own this one. I need to download this soon! It is a must have download for a shooter fan if you don't own the cartridge. I confess to not having been too interested in this until I just noticed the name Toaplan on the opening credits, had no idea it was one of their games but as I love nearly all their other shooters will definitely be checking this out. @ timp29 & Outrunner This will must likley to run at 50hz when it comes over here. Hanabi titles are supossed to run at 60hz but for some reason Sega converted their imports to 50hz which is just wrong. @ Tragickingdom There is a difference in PAL 50hz and PAL 60hz. 60hz is the same as NTSC but in 50hz for us PAL users the games are 17.5% slower and some games espically NES and Genesis titles have black boarders with slower music. What the...are you serious. I always assumed Sega's reaons for doing nothing with there PAL mega drive VC releases was laziness but now I hear they actually take the time to purposely cripple their hanabi releases? Surely that can't be right and Sega can't even use the old "that's how they always were" excuse (which is bad enough to begin with) to defend such actions. There are serious grounds for complaint with these titles as you are being sold an inferior product at an inflated price. Anybody who bought one should send a written complaint to Nintendo demanding a full refund. This is no joke. Puyo Puyo 2 and Gley Lancer both run in 50hz . Whats worse is that PP2 suffers from "slow music syndrome". I hope MUSHA doesn't suffer from this problem. Surely this is a reason for a valid complaint to both Sega and Nintendo. This is not "giving us the original" they are selling a knowingly butchered version of the game for a higher price! What is the justification for knowingly butchering your product just so that it looks and sounds as bad as the stuff you ususally shovel out? Go to Hell Nintendo and take Sega with you. @ Iapetus - I too own the cart and I honestly think that the combination of the art/design, the game-play, and the ahead-of-their time technical feats make this one of the finest shooters on the system! This is one of the reasons I was a Sega man first during the 16-bit era! Apparently PAL is supposed to be better due to better resolution. If the developers had bothered to get rid of the borders, slower music and slow game play then the games would be better than the NTSC versions. exactly. PAL is actually superior to NTSC not "different"
^ If you say so, but that's the first account I've heard of that. I understand what you're getting at, but you might want to settle with "different" when it's been the bane of European gamers for decades. 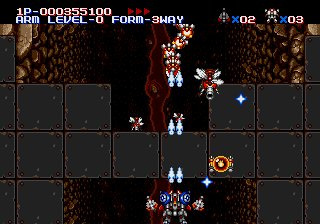 Hey, so (calling Mr. Shooter Experts) this or Star Parodier for best overhead shooter on the VC? 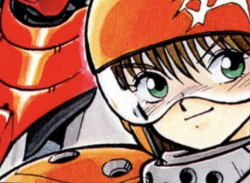 Soldier Blade and Musha are the closest as brothers... take your pick from there. 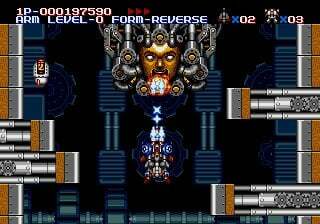 I'd say choosing between MUSHA or Star Parodier is more a matter of interest, for a good straight forward shooter with depth MUSHA would be my recommendation. Star Parodier has enough quality, but the experience is a bit more off the beaten track of shooter experiences, at least for me. 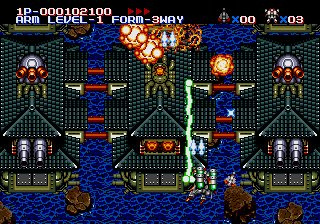 Still fun, and if compared on a raw score probably comes out ahead of MUSHA in raw total fun, but I think MUSHA would carry more value for a more serious shooter experience. Besides, who doesn't like flying a robot around instead of the usual spaceship/jet fare? Cool. 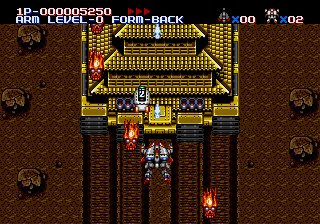 MUSHA looks way harder. But yeah, pretty different to compare. I periodically saw away at some of the shooters (still have several to beat) but I'm looking forward to prolly MUSHA first. Indeed they both look great. When I bought a Genesis years ago, this was one of the first games I bought. This game just has a certain "magic" to it that makes it one of the best shooters ever. This game is one of the best shooters you'll ever play. 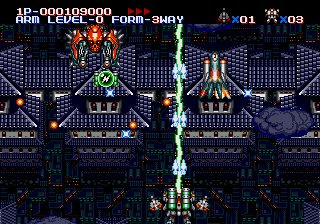 Up there with Ikaruga and Star Parodier. Truly amazing. A must-buy!